The registration fee for a single subject is Rs. 400/- for OC/BC candidates and Rs. 300/- for SC/ST/PH candidates. The registration fee may be paid at any TS/AP Online centers or through payment gateway(credited/Debit cards) / Net Banking . Candidates are strictly advised to write their permanent / working mobile number as well as correct residential address in the Online Application form. Hall tickets and Rank card along with first phase counseling schedule will be available in www.kudoa.in / www.kakatiya.ac.in. SMS alert will be sent to the mobile number. Separate application form should be submitted for each course. The Candidate has to opt the Test Centre by assigning tick (√) against Warangal OR Karimnagar. If the number of candidates registered for the test in Karimnagar for a particular subject is less than 100, the University reserves right to change the centre and conduct the test at Warangal only. However, the test centre for “5 Years Integrated M.Sc.” shall be in Warangal. 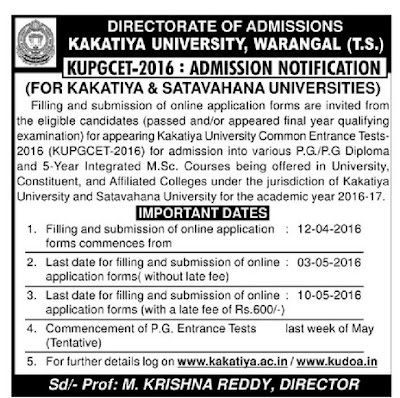 No separate application is required for applying for courses under Kakatiya University and Satavahana Universities. Time, Date of the Test, Name of the Examination Centre will be mentioned on the Hall Ticket downloaded by the Student. There are no qualifying marks in the Entrance Test for SC/ST candidates seeking admission to the course concerned. However, qualifying marks are 30 for OC,BC and PH candidates. Hostel Facility will not be provided to the students of Self-Finance Courses. Required fee (Bank draft / Challan), T.C. and other certificates must be submitted on the Spot on the day of admission counseling. The University reserves the right not to conduct Entrance Test in those courses where the numbers of applications received are inadequate. Number of Colleges and seats may vary due to wind up or addition of new colleges / new courses. 12. 5% supernumerary seats in each course are available to students from outside State of Telangana. 15% Supernumerary seats are also available to foreign students in each course without Entrance Test. Candidates have to mark the answer on OMR Answer sheet by darking the relevant circle with HB Pencil. A model sheet is available www.kudoa.in / www.kakatiya.ac.in. M.Com. Entrance Test shall be common for all specializations i.e., M.Com. General, M.Com. (FA), M.Com. (B & I), M.Com. (CA). M.Sc. (Mathematics) Entrance Test shall be common for M.Sc. (Mathematics), M.Sc. (Statistics), and M.Sc. (Applied Mathematics). There will be no Entrance Test for the courses of M.A (Sanskrit, Hindi, Urdu), M.Sc. (Food Science & Technology) and M.Sc., (MIT) but the candidates seeking admission into these courses have to submit the application in response to this notification. The admissions shall be made based on merit in the qualifying examination. Candidates who have passed or appeared for final year Intermediate Examination (MPC/BPC) of 2016 are eligible to apply for 5 Year Integrated M.Sc. Courses. Schedule of First Phase Admission Counseling will be intimated in the Marks/Rank Card. No Call Letters will separately be sent to the candidates. Admission counseling (first phase, second phase and spot) Schedule will be placed on the university website www.kudoa.in / www.kakatiya.ac.in. Hence, candidates are advised to regularly log on to the University website for information.